Christina Thomsen has always had an eye on the future. She took nursing prerequisites in high school, just in case she decided on a career in her mother’s field. When a college stint in history and secondary education failed to be a good fit, she knew nursing was a solid foundation for her future. While she waited to be admitted to the program, Thomsen completed her CNA course and took prerequisite nursing courses at NCK Tech. Today, Thomsen is finishing her second and final year in the nursing program. She’ll receive her associate’s degree in nursing and will be prepared for licensure through the National Council Licensure Examination (NCLEX-RN®). Thomsen’s vision for the future doesn’t stop there. 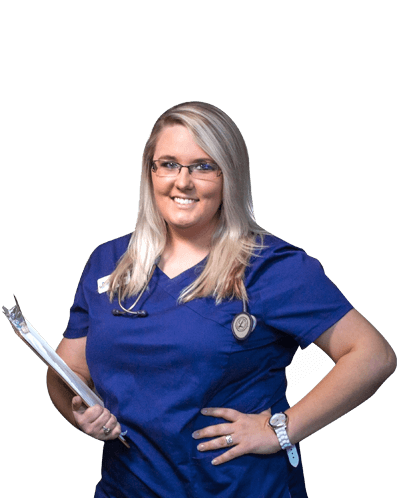 After NCK Tech, Thomsen plans to pursue her bachelor’s degree before working in critical and intensive care nursing. She’s confident she’ll be successful in both pursuits, thanks to NCK Tech’s 12-bed, state-of-the-art lab and personalized teaching style. Sandy Gottschalk, NCK Tech Hays Campus Dean, said these hands-on experiences reinforce the learning that takes place. This personalized instruction is carried on into the clinical setting, which usually takes place at the Hays Medical Center. Between the eight faculty members, there are 225 years of RN experience on the NCK Tech staff. Thomsen said her instructors go above and beyond to make sure their students can reach the same level of success. Thomsen said NCK Tech is full of many different types of learners, including nontraditional students. She enjoys the opportunity to work with people from many walks of life – a great life lesson as she continues to look ahead in her education and future career. “NCK Tech teaches at a very high level because they want their students to be able to reach that next step,” said Thomsen.